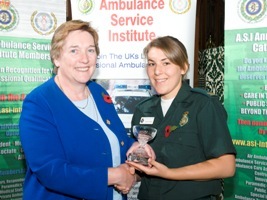 Three London Ambulance Service staff members have been presented with awards at a prestigious ceremony at the House of Commons. The trio were recognised at the Ambulance Service Institute awards yesterday (Thursday 29 October) in the presence of Jacqui Lait MP and the President of the Ambulance Service Institute Michael Pearce. 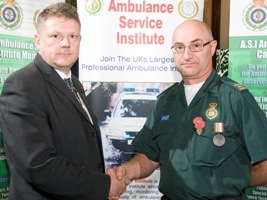 Michael, who is also an ambulance operations manager for the London Ambulance Service, said: “These awards give recognition to ambulance personnel who have taken that step above and beyond the call of duty. “They highlight some examples of the excellent work that is happening on a daily basis and ensure that at least a few of the unsung heroes can have their due recognition. Frank put his own life on the line to save two strangers when he came face to face with a violent attacker who killed one man and left another for dead. He was the first of the emergency services to arrive at the incident in West London in November 2006 and left the safety of his ambulance on two occasions to confront the attacker. His actions helped two women who were being assaulted to get away without serious injury. Frank himself was badly injured during the attack and needed to take a month off work to recover from his injuries. Sadly, one man sustained brain damage and another died. The attacker has since been detained indefinitely under the Mental Health Act. Madeline was faced with a patient who pulled out a gun during a routine call in Dagenham. Madeline was assessing the patient in the back of her ambulance when he pulled the gun and threatened to shoot her and her crewmate. She managed to divert his attention by dropping a folder and escaped via the back of the ambulance. Madeline was recognised for remaining calm during the ordeal and her sensible actions. The man who hijacked the ambulance was later sentenced to three-and-a-half years in prison. The gun was later discovered to be an imitation firearm. Rebecca works in the Service’s Urgent Operations Centre, delivering telephone advice to patients who have neither serious nor life-threatening injuries or illness, and who require some form of alternative care. Rebecca was recognised for her excellent communication skills and leadership skills, and continuous reassurance and empathy to her patients. She has excellent clinical knowledge and is a focused, dedicated team player who puts patient well being to the forefront in her delivery of patient care. 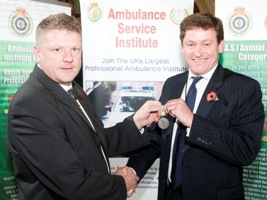 The Ambulance Service Institute awards aim to recognise the best of the best in pre-hospital care and are now in their 11th year. It has been the eighth year they have been held at the House of Commons.